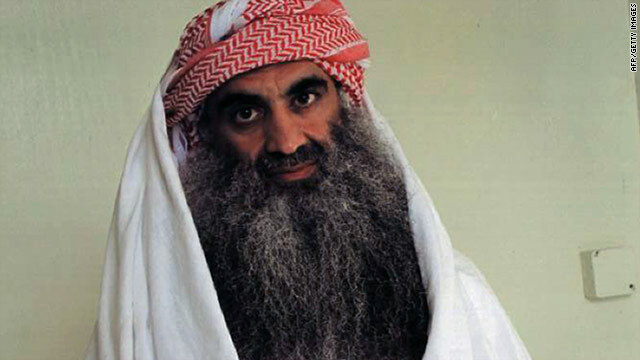 The admitted mastermind of the 9/11 terror attacks has issued a rambling defense of Osama bin Laden's son-in-law, on trial in New York for allegedly being al Qaeda's propagandist in the wake of the attacks. In a rare statement made public, Khalid Sheikh Mohammed said Sulaiman abu Ghaith - an Islamic preacher whom the United States has charged with conspiracy to kill U.S. nationals and providing material support to terrorists - is falsely accused of being involved in al Qaeda's military activities. Mohammed said abu Ahaith was more of a visiting celebrity who preached the Quran to al Qaeda recruits. Mohammed's 14-page statement was in response to questions from abu Ghaith's attorney and was filed in U.S. District Court in Manhattan on Sunday night. 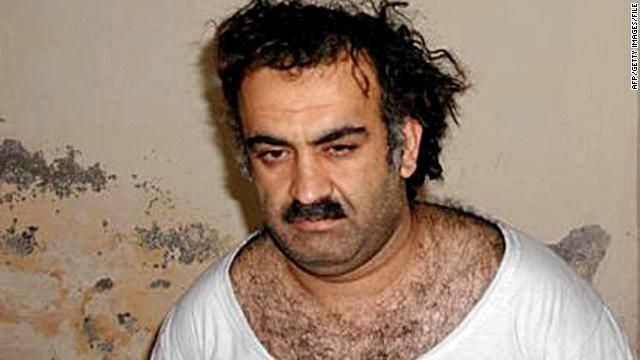 Accused 9/11 mastermind Khalid Sheikh Mohammed asserted on Wednesday that the U.S. government sanctioned torture in the name of national security, and compared the scale of the terror attack that killed nearly 3,000 people to the "millions" he said have been killed by America's military. "Many can kill people under the name of national security, and torture people under the name of national security," Mohammed said during a pretrial hearing at the U.S. military base at Guantanamo Bay, Cuba. "This is a resilient definition," he said in open court, as military censors stood ready to interrupt the video and audio. "Every dictator can put on shoes to step on this definition, every law, every constitution, with this definition any can evade the rule and also go against it," he said. He also compared the nearly 3,000 victims killed in the 9/11 hijack attacks in New York, Washington and western Pennsylvania to killings he blamed on the American military that he said number in the "millions." 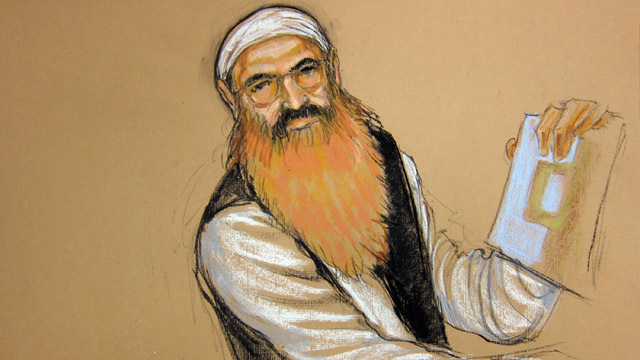 The pretrial hearing for accused 9/11 mastermind Khalid Sheikh Mohammed and four other alleged co-conspirators was focused for much of Tuesday morning on the detainee dress code. The hearing at the U.S. Naval Base at Guantanamo Bay, Cuba, was broadcast via closed circuit television to victims' families and the news media at Fort Meade, Maryland. The defense challenged a practice by the jailers to ban certain types of clothing. In oral arguments on a motion to clarify a dress code for detainees while they are in the courtroom, prosecutors said the ban was part of preserving decorum and respect for the venue, and also one of security. 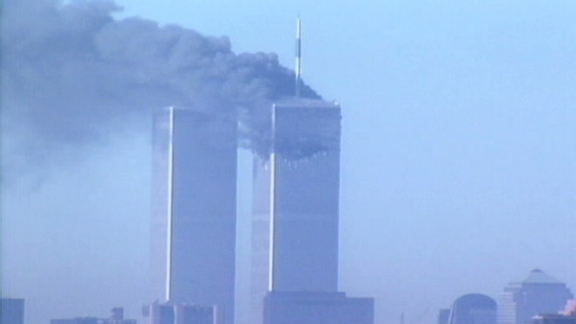 (CNN) - Through hours of outbursts and objections in military court, Eddie Bracken said he had one image in his mind: that of a plane smashing into the World Trade Center tower where his sister worked. Anger surged inside him, Bracken told reporters Sunday, a day after he sat among a group of victim family members who watched the arraignment of accused 9/11 mastermind Khalid Sheikh Mohammed and four others at Guantanamo Bay, the U.S. naval base where the men are being tried before a military court. "Just listening to that rhetoric, how they perceive themselves - it's hurtful, because they have no remorse. I don't think they even have any souls," he said. Bracken's sister, Lucy Fishman, worked as a secretary on the 105th floor of the south tower of the World Trade Center. She was one of the nearly 3,000 people killed when the towers were brought down by hijacked jetliners on September 11, 2001. The arraignment for accused 9/11 mastermind Khalid Sheikh Mohammed and four others before a military commission in Guantanamo Bay, Cuba is underway. But almost immediately after they began, the proceedings were bogged down by side issues. 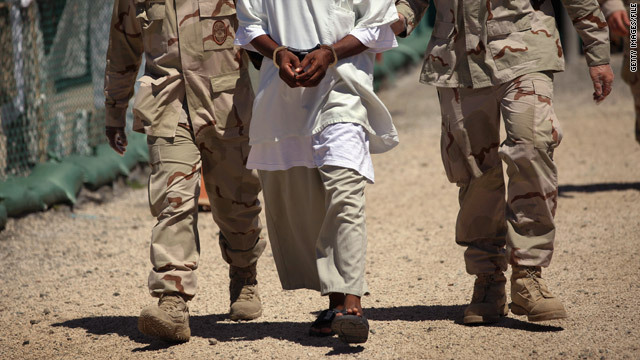 Along with Mohammed, the other defendents are Walid Muhammad Salih Mubarak Bin 'Attash, Ramzi Binalshibh, Ali Abdul Aziz Ali, and Mustafa Ahmed Adam al Hawsawi. The five are charged with terrorism, hijacking aircraft, conspiracy, murder in violation of the law of war, attacking civilians, attacking civilian objects, intentionally causing serious bodily injury and destruction of property in violation of the law of war. The charges allege that the five are "responsible for the planning and execution of the attacks of Sept. 11, 2001, in New York, Washington, D.C., and Shanksville, Pa., resulting in the killing of 2,976 people," the Defense Department said. Follow updates on the arraignment here. The Obama administration's struggle over how to handle the prisoners and prison at Guantanamo Bay, Cuba, enters a new chapter Saturday when a military judge there will convene an arraignment for Khalid Sheikh Mohammed and four other men for their alleged roles in the September 11 terrorist attacks. It could be a routine military commission hearing, with charges being read and pleas being entered, or it could be the latest act of a legal and political free-for-all. Scores of pages of al Qaeda documents seized in last year's U.S. raid that killed Osama bin Laden were released Thursday. They comprise 175 pages in the original Arabic of letters and drafts from bin Laden and other key al Qaeda figures, including the American Adam Gadahn and Abu Yahya al-Libi. The chief judge for the Guantanamo Bay military commissions has assigned himself to preside over the trial of alleged 9/11 mastermind Khalid Shaikh Mohammad and four other men. Army Col. James Pohl will preside over the arraignment of the five suspected terrorists beginning on May 5. Mohammad, Walid Muhammad Salih Mubarak Bin 'Attash, Ramzi Binalshibh, Ali Abdul Aziz Ali and Mustafa Ahmed Adam al Hawsawi are accused of the "planning and execution of the attacks of Sept. 11, 2001, in New York, Washington, D.C., and Shanksville, Pa., resulting in the killing of 2,976 people," a Defense Department statement said. The charges include murder in violation of the law of war, attacking civilians and civilian objects, hijacking aircraft and terrorism. If convicted, all five suspects could face the death penalty. Pohl is already presiding over the trial of Rahim al Nashiri, the only other military commission trial underway at Guantanamo Bay, Cuba. He's also been involved in the criminal cases stemming from the Abu Ghraib scandal and was the investigating officer in the case of Maj. Nidal Hasan, the man accused of killing of 13 people at Fort Hood, Texas, in 2009. The United States on Wednesday announced charges against Khalid Sheikh Mohammed, the accused mastermind of the September 11, 2001, terrorist attacks, and four others accused of involvement in the plot.